Developed by using a wide variety of vigorous hybrid plants found within the cold hardy Douglass hybrids from upstate New York where temperatures go below -30F. This older planting done in the 1970's was more or less an accidental crossing of the Manchurian and American chestnut. 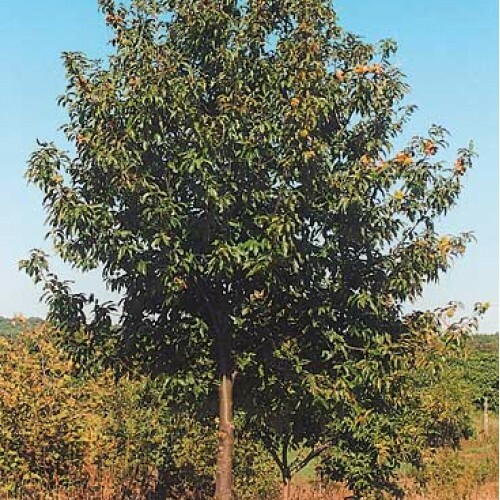 Earl Douglass found these to be much longer lived and immune or highly resistant to chestnut blight. When we started using his seeds for the production of seedlings, little did we realize that 30 years later we still find these to be such a valuable seed selection. We maintain our orchard by removing the most disease-prone trees and collect seeds from the most vigorous and healthy. We continue that to this day. 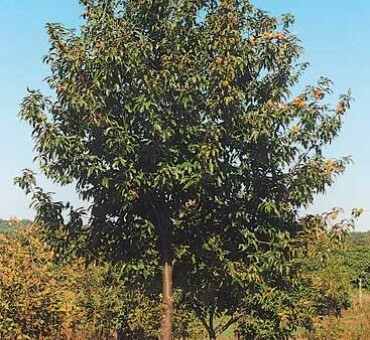 This pool of hybrid plants represents quite a large span of unique chestnut trees that are intermediate in size of the Chinese and American trees. Blight and insect free plants are grown in screened greenhouses. No shipment to CA,OR,WA. Self infertile. Needs two plants or another chestnut of any type. Easy to grow, this selection shows very good promise of high blight resistance and strong upright growth.